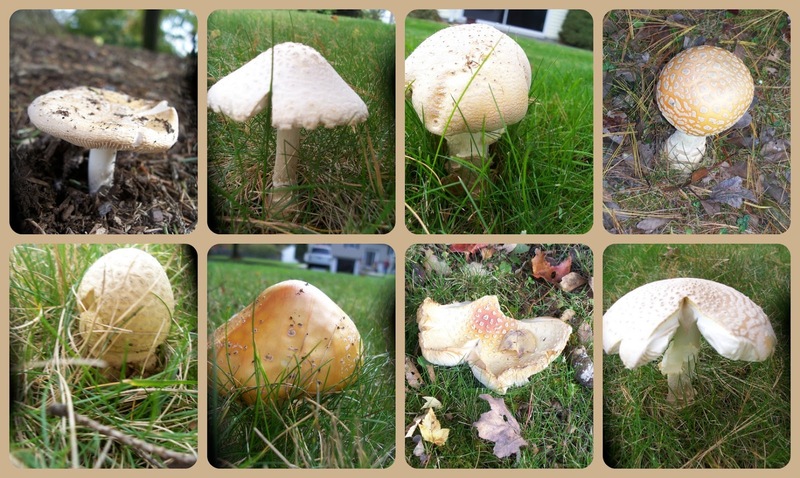 After having quite a bit of rain lately, we have been noticing lots of mushrooms popping up all over the place. And we have been noticing the different sizes, colors, shapes of them all. We look at every mushroom and think about what fairy will live there. So when we saw bunches of them we called them villages. We had quite a bit of fun finding them. The past couple of days we have had gorgeous afternoons, so Hazel and I went on a nature walk and/or a nature bike ride. Today she rode her bike around the short loop, but of course there were several times where Mommy was walking the bike. 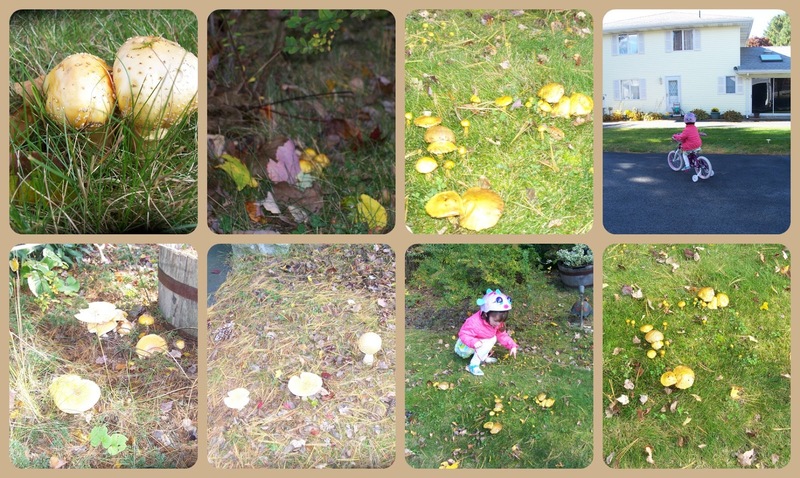 She also had to get down and count the yellow mushrooms to see how many fairies could live there. 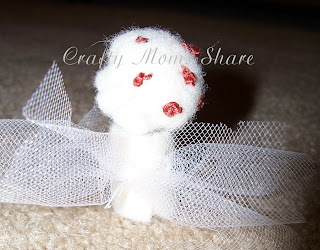 Our mushroom fairy story is simple. When it rains the mushroom fairies get to work growing their mushrooms so all the fairies have places to live and animals have things to eat. After several days of rain then a day of sun and then more rain, our neighborhood is loaded with mushrooms so we have been having fun looking at them and thinking about the fairies that might live there. I made the little mushroom fairy peg doll the other day for Hazel. I used a paint marker for the face and hair and felt for the clothes and hat. I did my best at French knots for the dots on the mushroom, but I still have not completely mastered them. 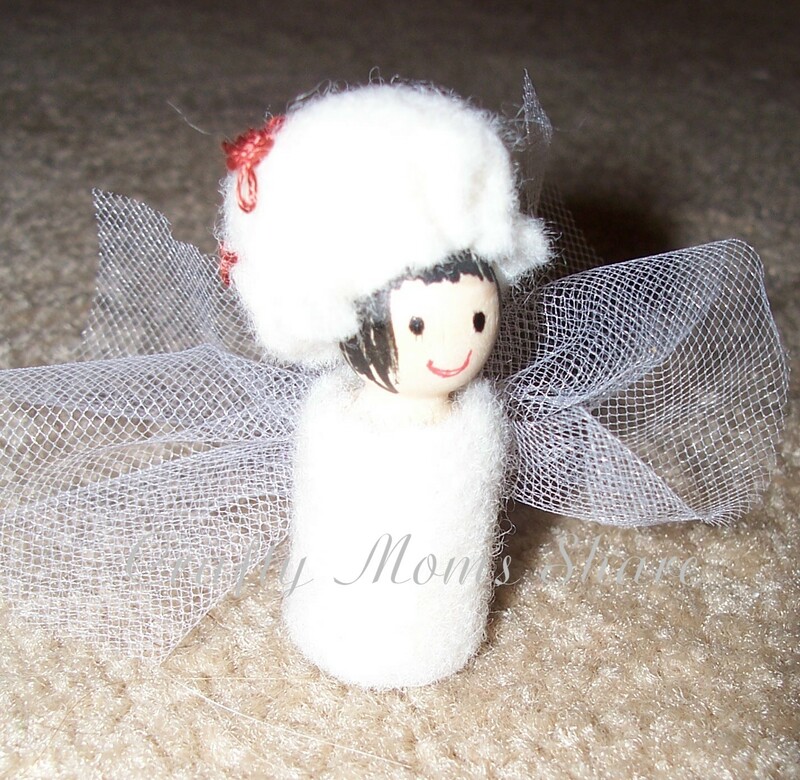 Then I took a piece of tulle for the wings and tied it in the center and sewed it on to the felt. Have the mushroom fairies been to your neighborhood lately? That's a cute idea.. it doesn't take much to make something a little girl will love! Now that is super cute! I might make one! Stopping by from Moms Library Link up! What a cute little mushroom fairy and great mushroom photos. French knots took me quite some time to get the hang of, I finally watched (and re-watched) a youtube instructional video from MaryCorbet (she has wonderful embroidery tutorials) and then I finally got them down. :) We love it when the toadstools and mushrooms pop up in the garden. These are so sweet! I can imagine making all different fairies for all the different types of mushrooms! We love mushrooms here. 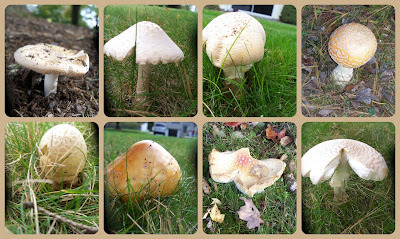 Nice group of mushroom pictures! Really cute! My daughters don't like to eat them, but are fascinated when I buy them from the store. Thanks for sharing at Mom's Library! Thanks for linking to Waldorf Wednesday. Hope to see you back this week!